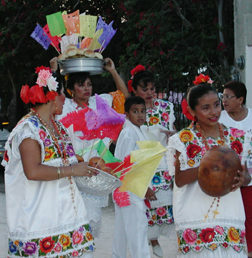 Celebrated every year in the village of El Cedral, this celebration commemorates the founding of the first city in Cozumel over 120 years ago. El Cedral is a charming little village located about 10 miles south of San Miguel. Normally a very quiet community with just a scattering of residents, this little berg becomes a bustling hub of activity from April 29 through May 3 each year. The pristine community of colorful cottages with thatched roofs and seldom-used narrow dirt roads transforms into for the 5-day festival, and then thankfully, slips back into its original reserved mode. It's comparable to a state fair in the US where mom, pop and the kids make their pilgrimage to the festival each year. Carnival rides are offered on the "midway", but these are for tots only, no roller coasters, tilt-a-whirl or upside-down death-defying dare devil rides here. Locals try their luck at carnival games, hoping to win a stuffed monkey or a purple dinosaur. There are beer gardens galore, and food stalls offer everything from ice cream, to corn on the cob (note that Mexican version is an awful lot like eating field corn), french fries, fresh grilled chicken and lots of unidentified goodies and treats. Fast-talking salesmen offer their wares. You almost expect to bump into Ron Popeil pitching his pocket fisherman or veg-o-matic. Brahma bulls and prized steeds are on display. 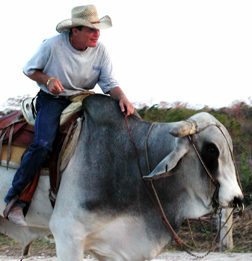 Horse races, bull fights and various other competitions are scheduled throughout the week. Action generally begins in the evening, though some events may take place late afternoons. Beer sales are brisk as usual during special festivals such as this one. Children dash about, their bright eyes filled with wonder as they absorb the colors and spectacles of the event. Little girls gather in grassy areas to jump rope. Lovers hold hands and navigate the crowd. Friends gather to share a beer and observe the crowds. Same as the state fair, but on a smaller scale and with a Mexican flavor. Unlike the state fair, parking is free; but local residents will charge you if you'd like to use their bathroom. We popped in to the festival on the final evening of the celebration. Cozumelenos in their crisp white and brightly colored native costumes were assembled in a large main square for an exhibition of folk dance. Young children and adults provided entertainment to festive Mexican music as spectators oohed and ahhed at the lively steps and lovely costumes. You can settle into a beer garden with live music or choose a quieter one and watch the people as they celebrate El Cedral. It's a pleasant experience and quite another peak at Cozumel and the islanders' proud heritage. And, in the plum-full parking lot, we observed one of those proverbial "Mexican standoffs." At the intersection of two roads were 4 huge trucks, each filling the entire lane of traffic and dangerously close to scraping the parked cars which lined the sides of the road. Facing each other at the crossing, they stood firm; none could move ahead without another budging. We watched with interest to see how they would handle this Mexican standoff. We quietly stood and waited. They were either very patient or very stubborn. They honked; they waved, they whistled but they were unyielding. We sat down and became their audience. Their resolve deepened. They apparently take a Mexican stand off very seriously. The intersection wasn't unclogged until a Mexican family strolled by, the father pushing a handicapped son in his wheelchair. This good samaritan safely pushed his son alongside the road and then stepped in to take control. He obviously was experienced at directing traffic and he issued directions with authority and grace and he waved, whistled and signaled the trucks until they were able to maneuver out of their traffic jam and we moved on. After wandering around trying to remember where we parked the car, we located our black beauty rental vehicle under a deep layer of dust. It was a lovely evening for a Mexican version of the state fair. Interested in a remote location? More NEW properties! : Taj-Kumal, Villa Marvi, Villa Toscano and more! News notes: Restaurants, happenings, updates, gossip . . . NEW ferry!